Hailed as the first DP2-rated jack-up built in Japan for offshore wind-related projects, the self-propelled CP-8001, which incorporates GustoMSC’s four-legged GJ-3750C design, will be utilised by Tokyo-based civil construction company Penta-Ocean. 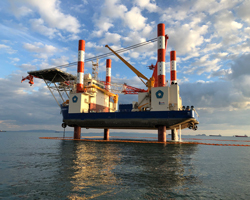 The vessel’s construction was handled by Japan Marine United and it is reportedly the largest dynamic positioning (DP)-enhanced jack-up registered by ClassNK to date. With 30,000km of coastline at its disposal, Japan would appear to be an ideal territory for offshore wind farm development. According to some analysts, the country could reap a potential 1,600GW of offshore wind farm power in total. In November 2018, the country’s government passed a bill permitting wind farms to operate in Japanese waters for up to 30 years (previously, this timeframe had typically been restricted to three to five years), and energy majors such as Tokyo Electric Power Company and E.ON have not been slow in sizing up this Asian market. This progress ties in well with the Japanese Government’s stated aim of decarbonising its economy by 2050. CP-8001 measures 70m in length and 40m in breadth, and has been designed to install large-scale wind farm structures – for instance, 10MW-rated turbines – in water depths of up to 30m, with leg lengths of 66m. However, deeper waters are possible: CP-8001 can handle installations in depths of up to 50m, with leg lengths of 86m. The rig also utilises an 800tonne-capacity pedestal crane, supplied by Huisman. Thomas Lerchenmüller, design manager for jack-ups at GustoMSC, tells Offshore Marine Technology: “We didn’t approach the design only in terms of it being ‘a jack-up carrying a crane’ – the design is integral, with all aspects optimised for the main purposes of the vessel.” The rig's onboard living quarters provide room for up to 120 persons, and this complement can also make use of offices and recreational rooms. The GJ-3750C class also incorporates a helideck into its design, to facilitate crew changes and for emergency response. The GJ-3750C class features the GustoMSC 3750C continuous jacking system, which is based on the larger systems used in the designer’s NG-9000C wind farm maintenance and NG-5500C construction rig types. By incorporating this jacking system, the operator can lift the GJ-3750C rig’s platform in a continuous motion at a rate of 400mm per minute. The jacking system has a pre-load capacity of 3,750tonnes per leg.